The brand new £15 million Crewe Lifestyle Centre opened in April 2016, providing a state-of-the-art sports and community complex in the heart of the town. 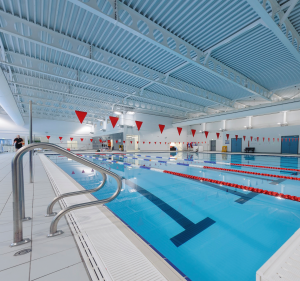 Wrightfield Pools worked with the main contractors on the project, Kier Construction, to design and install the eight-lane Natare stainless steel pool. “Kier’s approach had been driven by recent issues experienced with concrete pools and a previously good experience installing a specified modular stainless steel pool build,” explains Mark Watson, Pool Sales Manager at Wrightfield Pools. The construction of the Natare pool system is in essence a factory-built wall and floor system, built in sections up to 6m in length. The wall sections are installed on a pre-formed concrete slab profile and the wall sections are then TIG welded together on site to form an integrated pool wall and gutter system, incorporating a deck drain if so desired. The completed pool is then dressed with a UPVC lining system, providing a waterproof membrane for the pool. “The pool plant room is as minimal as you can possibly get, with the complete filtration and chemical treatment system for two pools being located within a footprint of 10.5x4m,” explains Mark. “This approach saves on construction costs, removing the need for a basement on the original design, and the balance tanks were no longer required,” he adds.